A bare area in the flower garden can be fixed by adding in a pot of blooms, you can grow an abundance of fruit and veg even if you have a tiny terrace or balcony, you can add balance with potted climbers such clematis, you can grow plants in locations where the soil is unsuitable for a particular variety, the possibilities are endless. Containers give you the chance to be imaginative, to try something different, and allow you to provide year round interest. You can use virtually anything for a container, it's just got to be deep enough and allow for water to drain. Be creative, don't restrict yourself to purpose made pots. 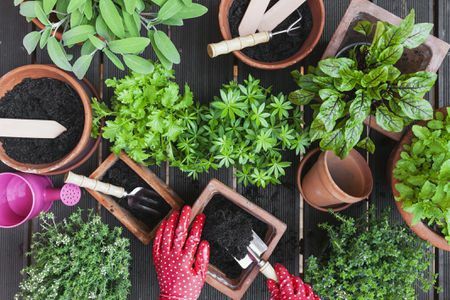 Olive oil cans, a rusty wheelbarrow, an old boot, let your imagination run wild, anything unusual or quirky will add to the charm of your growing space, just make sure the container is a suitable size for the varieties you wish to grow. It's important that you know how to pot plants properly. First, make sure there's good size drainage hole in the bottom and add some broken crocks or chunks of polystyrene in the bottom to stop the hole from getting blocked. Next add a nutrient rich soil based compost. Select an Ericaceous type for acid-loving plants such as Azaleas and Blueberries. If you wish you could add water retaining crystals at this point for increased drought resistance, and if the plants require good drainage, grit. Finally, once your plants are in the pots, top up with a water retaining mulch such as bark chips. Tackling your planting with a plan your planting will save you a lot of heartache later. Think about the new location for the container and plant for the conditions. There's no point planting a pot full of lavender and rosemary if it's going to be placed in a shady corner for example. Decide how much effort you wish to dedicate to looking after your pots. Perhaps you want extremely low-maintenance, then grasses such as Festuca Glaucia Elija Blue, or giant feather grass, Stipa Gigantea, are not only less demanding but are modern and funky choices. But really, the maintenance needed is mostly not that great, just regular watering and feeding - the slow release container fertilizers are perfect, releasing nutrients throughout the whole year after a single application. As for which varieties to go with just experiment. Create a combined vegetable and flower container perhaps. Vegetables are not only handy in the kitchen but can be attractive plants in their own right. A big container with minipops sweetcorn, courgette midnight, cut and come again lollo rosso salad leaves, and dwarf borlotto type french beans will not only give you tasty crops but also look wonderful. Perhaps you've always wanted a lemon tree? Then grow one in a large pot, you can place it outside in the summer, and bring it into the greenhouse or conservatory when the weather turns colder. So, containers will allow you to have a fluid and adaptable garden space, making it easy to change to seasonal needs and aesthetic choices. Just let your imagination go wild.